Before falling pregnant with Oscar (and therefore long before I knew the hell of HG) I had to give up full-time employment due to a different health issue. In order to keep myself sane during the many long hours spent recovering, I took up jewellery making and set myself up as a "mini business" so I could sell items on and fund more materials. It was never going to be a major enterprise, it was far more about having something to occupy my hands and mind and it brought about some lovely unexpected projects. In fact the very month before falling pregnant I spent a wonderful afternoon teaching kids how to create beaded tree decorations as part of the annual Christmas "Family Day" held in our local pub. It was something I truly enjoyed doing and I found that my most popular and well-loved items were those which had been crocheted with wire and beads. 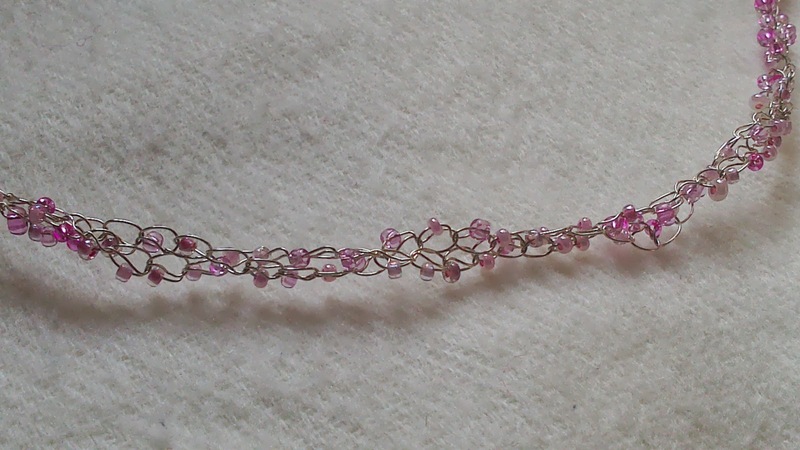 I'd use a silver-plated copper wire which was strong enough to cope with a fair amount of working but delicate enough to create pretty little items. I played around with lots of different bead combinations including some rather beautiful semi-precious stones. And it was a real joy to create necklaces and bracelets in this way. Which is why crocheted jewellery has been at the back of my mind ever since I started this Nine Months Of challenge. Crochet doesn't have to be all about blankets, bags and hats. You don't have to limit yourself to items for baby, you can make beautiful gifts for the new mum too! Some of my favourite memories of the early days of motherhood were being presented with something just for me, to remind me that although I was now somebody's mother (and that this would be the most important aspect of my life from now on) I still had an identity of my own. Yes, I might be wearing a pair of milk-stained pyjamas at 3 o'clock in the afternoon when the visitors arrived but at least I had a pretty necklace to wear to make me feel a little less "under-dressed". 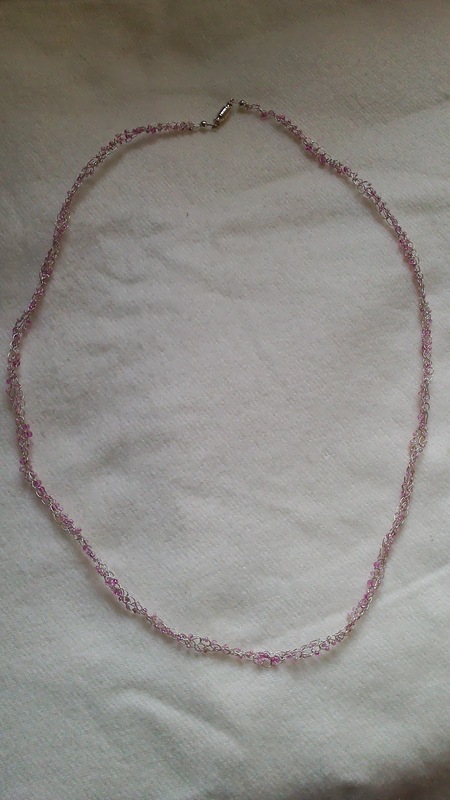 With this in mind I decided on a delicate colour scheme for my first necklace. I've never really crocheted with seed beads before, preferring larger beads for their ability to stand out from the wire, but it seemed right to work with these tiny beads this time. I've also generally crocheted items with more than two strings of wire to make them a little bulkier, but this time I wanted to keep it plain and simple. And I'm glad I did as the end result is so very dainty and pretty. In fact I am calling this necklace "Pretty in Pink" and I do hope that when it goes up for sale in the auction next May someone will find it as pretty as I do! This, like all other items I create, will be going up for auction on eBay in May 2014 to raise funds for Pregnancy Sickness Support. In the meantime, if you'd like to sponsor me during my challenge (to crochet as many items as possible over nine months) you can do so by visiting my BT Donate page. Thank you.